Hello! hope you're all having a lovely weekend. I was sent this lovely top last week by relatively new brand, Just Curvy this week to review. I'm a complete sucker for stripes, I own a LOT, I hate that even in this day and age women are told not to wear horizontal stripes because they will make them look fat, well, you know what? 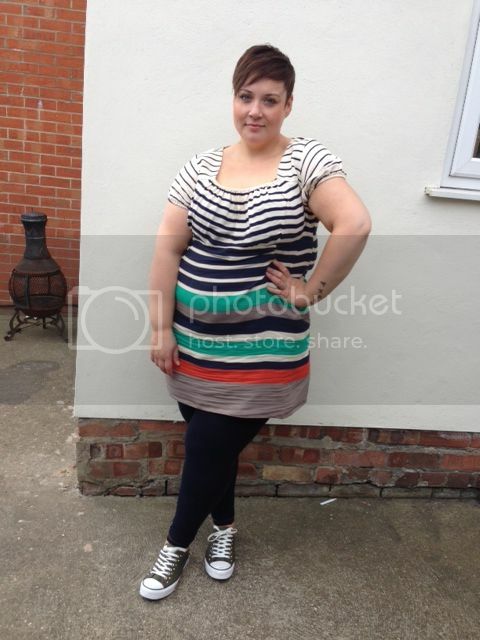 I am fat, so I'm going to wear my gorgeous stripes with pride! I chose this tunic from the site because I loved the colours and shape, it looked like a great casual option for running around after Poppy, nipping in to town, that kind of thing! The top is made of a lightweight cotton material, it doesn't have any stretch to it though so that is something to consider when ordering. I went with the 22/24, and it was a good fit, it didn't have heaps of room though, so again, something to think about. The top is really comfortable, it fastens in the back with a zip, but I just popped it over my head. There was plenty of room in the bust so for those of you more blessed than me you should be ok! I loved that the top had pockets too, little features like that really make a garment for me! The top itself is a Lovedrobe top, a brand I've never worn before, now I know what the sizing is like I'm excited to try some more bits! Overall I loved this top, I think for me personally I would have liked a little elastane in the material for my personal comfort, but having said that it was still really comfortable. 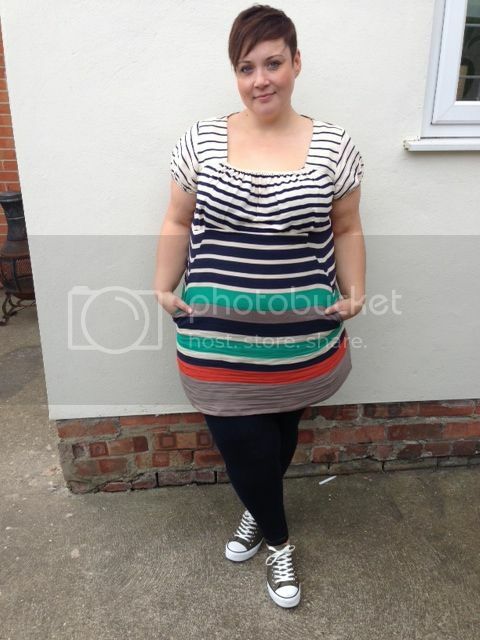 Thanks Just Curvy, it's a fab top! I've been lusting after this top for a while, and seeing you in it has made up my mind to buy it! From what you say tho, I may need to size up. I'm a classic pear, so need tops to be a bit more generous on the bottom half. Your curves are beautiful ! - all real women have curves !